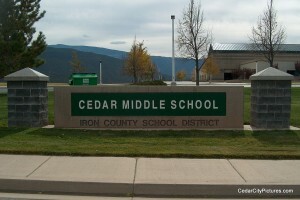 Cedar Middle School is located at 2215 W Royal Hunte Dr. The principal is Kendall Benson and the vice principal is Trent Nielsen. Cedar Middle School used to be located just north of the SUU Hunter Conference building. The mascot is the Warriors. Randy Ence was a former principal of Cedar Middle School.